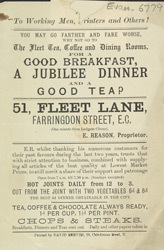 The spread of tea and coffee shops in the late 19th century played an important part in encouraging women’s independence. Respectable women could visit these establishments unaccompanied for the first time. As well as tea, these coffee shops also sold nutritious and inexpensive meals.